The Bond Knitting machine also known as the Ultimate Sweater Machine, takes the craft of knitting to a new level. You can now make a sweater in a fraction of the time then with hand knitting. When you purchase this machine you get all the knitting equipment needed to begin. 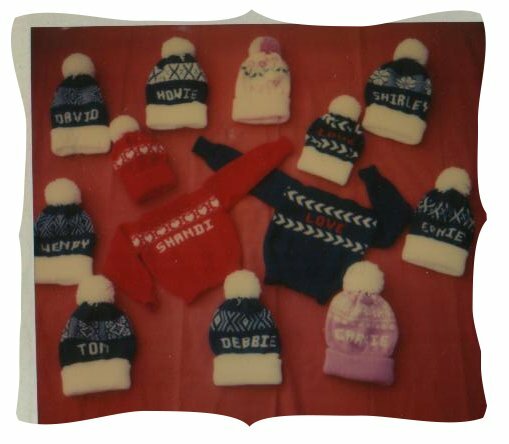 For many, many years the craft of knitting clothing and blankets by hand took an enormous amount of time and effort. Leaving little time to develop new designs and produce more then a few items in a select period of time. 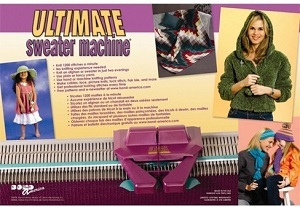 This machine, also known as the 'Ultimate Sweater Machine” is a preferred way to produce multiple projects with yarn. Such as producing a sweater in a few short hours when it ordinarily would take a week or more of time, knitting it by hand. Knitting machines have quite a few choices in brands. They range from the simple manual assisted knitting machine to the latest in computerized machines that are extremely complex, capable of knitting a blanket, twenty inches long in under seven minutes. The best machine to start with is one that is not as complicated. This machine has key plates to be able to handle multiple types of knitting patterns, sized and designs. For most people, this design will suit their purposes fine. 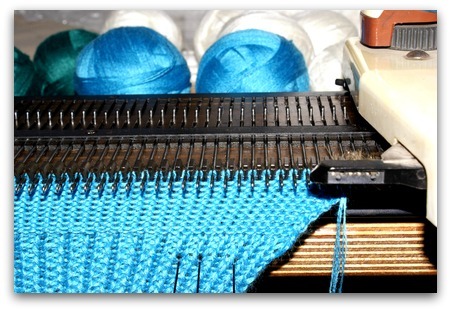 The basic machine will knit from six hundred stitches to twice that in a matter of minutes. Perhaps the best point of this machine is that it will handle an amazing number of different projects and yarns. From tiny booties for premature babies to the cable knits of heavy-duty sweaters for men. This machine is easy to use and features adaptable designs with plenty of illustrations to follow as well as examples of more complex designs to use. You can also find online clubs and patterns just for this machine. And after you are comfortable with the machine you may be able to convert some hand knitted patterns to machine knitting. It really isn't that hard. The Bond Knitting machine is used by many people for their own use and as a home business to make a fun filled hobby into a means of making some extra money. But if your plan is to have a home business you will outgrow this machine quickly. The Bond will not hold up to the heavy production work numbers needed for a business. Not saying you can't sell your items you make on this machine. But this is a great machine for the home knitter. One of the disadvantages of buying a more advance machine is the cost. It could be very expensive to buy a new machine that has all the bells and whistles. The Bond Knitting machine is perfect for the beginner that is just interested in home knitting. 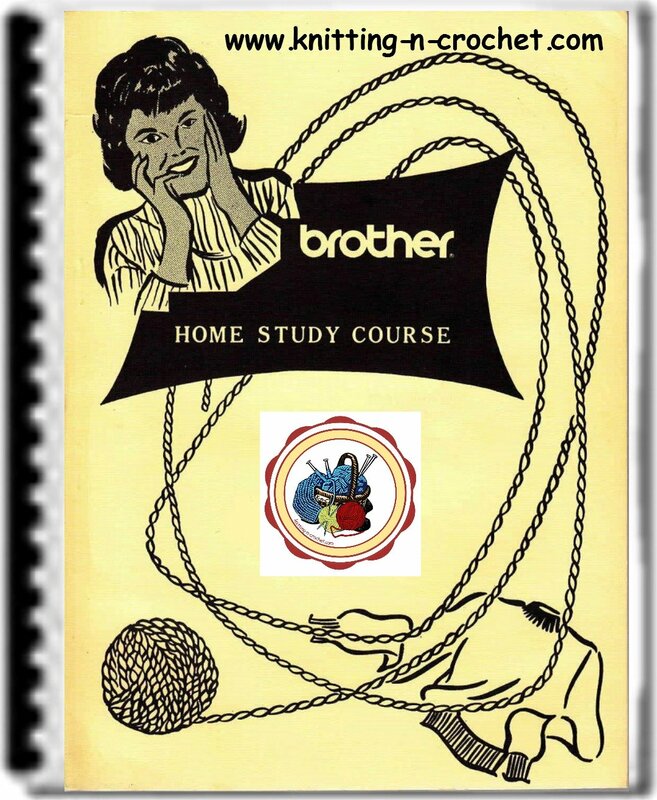 There are books out with many patterns and also a forum online where many share ideas and patterns. Bond Knitting Machines are definitely the way to go if you are considering investing in one for either yourself or a family member. As they say "Make it tonight and wear it tomorrow". They will add a new dimension to the creativity and gift giving abilities you have. Give yourself a little time to learn and grow with experimenting with the designs and patterns of machine knitting and you will find this is a great way to knit. Whether you know how to knit by hand or just can't get the hang of two needles, knitting machines add a whole new dimension to your knitting.